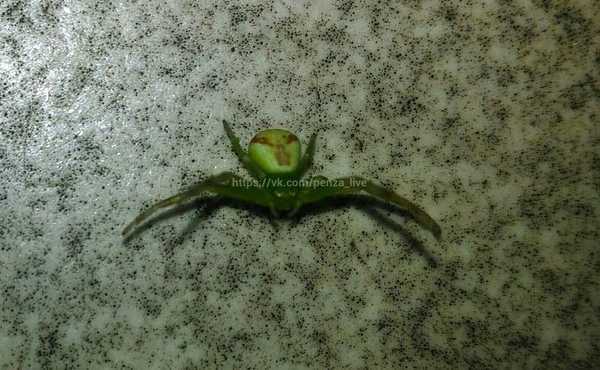 On September 2016, a resident of Penza, Russia, were shocked when woke up and found a green strange looking spider with a bloated humanoid head on its abdomen. Two photos of the spider appeared at the Penza Online subsection of the popular VKontakte website on September 27th, captioned (via machine translation) “Users that for a spider? Who knows? Toxic or Not?” The post rapidly went viral, racking up over 100 comments before moderators restricted commenting. The spooky arachnid has face-like markings on its day-glow abdomen that bear a striking resemblance to little green aliens from planet Mars. When pictures of the spider began emerging on Russian websites, there were fears that a poisonous monster from outer space was beginning its conquest of Earth. Fortunately, the photograph was forwarded to someone who knows something about "alien spiders". The picture reached Penza entomologist Oleg Polumordvinov, who identified the alien monster as a 6 mm (.25 inch) Ebrechtella tricuspidata – a flower crab spider that is widespread but rarely seen in central Europe. A species that grows little more than 6mm. Mr. Oleg explained how they are found regularly in woods during the autumn and eat only flies. But they are incapable of biting through human skin, he added. The zoologist believes the spider must have been brought into the flat from outside and underlined that there was no need to be afraid.